I am a great admirer of Dorothy Draper. 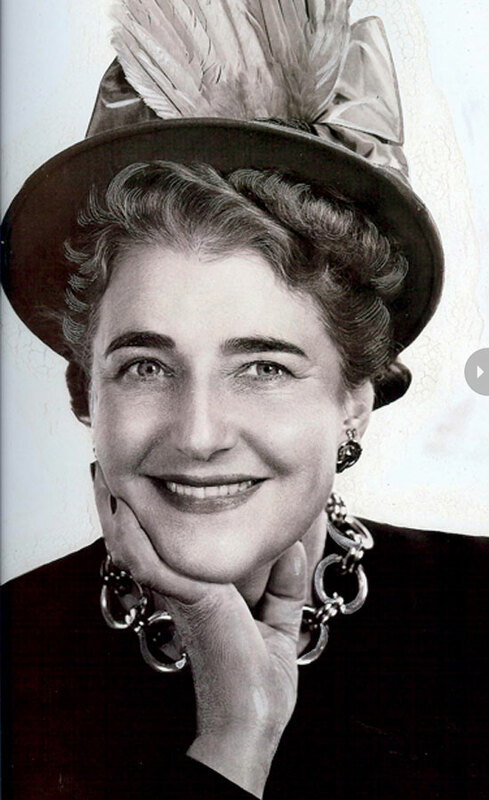 Born in 1889, she became known as “America’s most fabulous decorator”, and she helped inspire a generation of home improvement devotees with her 1939 book Decorating is Fun!. Dorothy was the antithesis of a minimalist. She was a lover of bold chintzes, bright “happy” colours, over-scaled furniture and floor tiles, rococo scrollwork, wide stripes, and Baroque plasterwork. Over the top? You might say so. Yes, you could definitely say so. But so much fun. Her rooms, like her, were full of verve and joie de vivre. 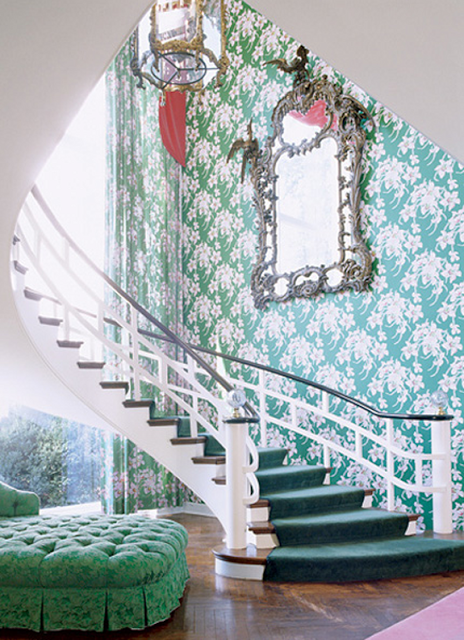 Her rooms were iconic — a total rethinking of classical style which became known as American Baroque. She was all about bringing joy into people’s lives. 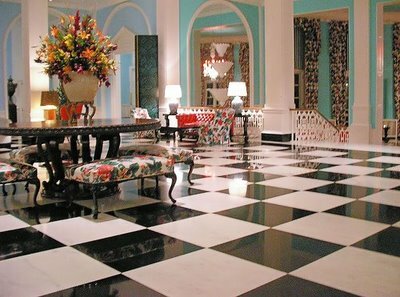 One of Dorothy’s most famous designs was for The Greenbrier Hotel in White Sulpher Springs, West Virginia. 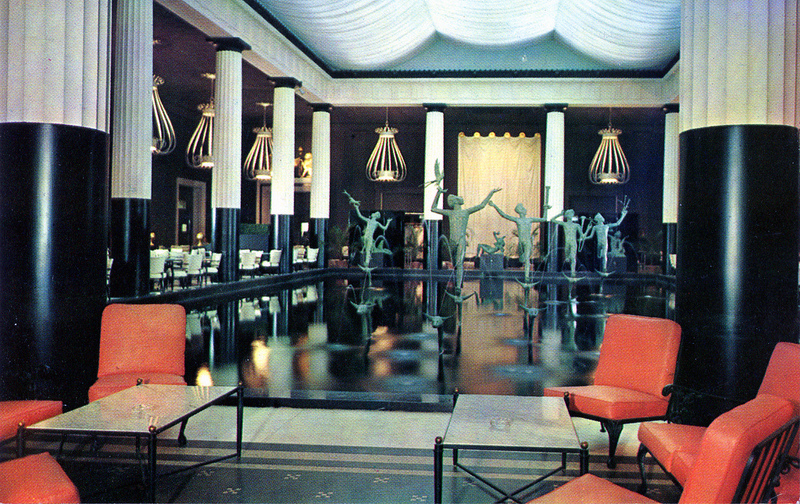 The owners, the Chesapeake & Ohio Railway company, hired Dorothy to redecorate the entire resort. 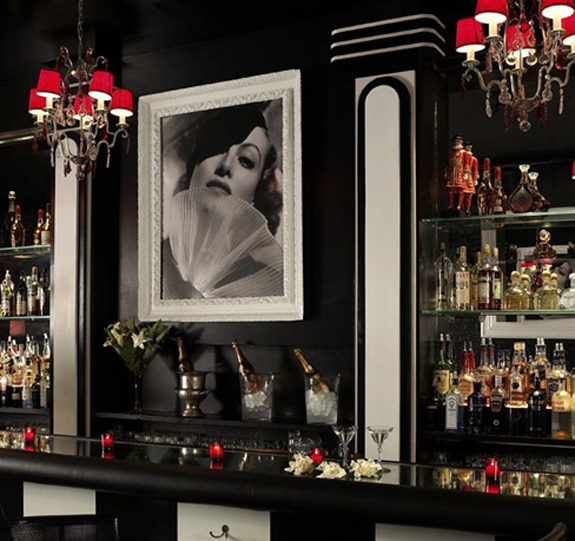 She designed everything from the staff uniforms to the matchbook covers. The opening attracted the movers and shakers of the day. 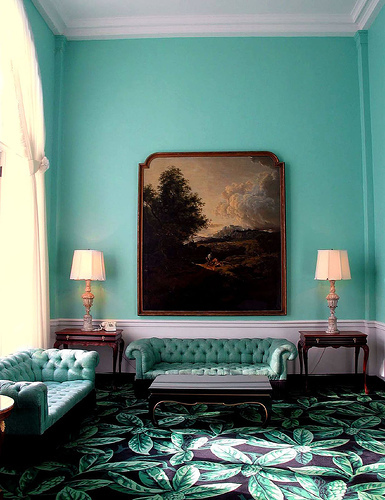 The Greenbrier. Signature Dorothy Draper style with the large black and white tiles, clear colours and chintz curtains. 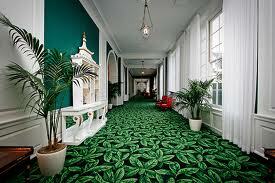 Hallway in the Greenbrier. Note the Baroque plasterwork and large-scale plant motif in the carpet. Dorothy particularly loved green and blue as these were the colours of nature. 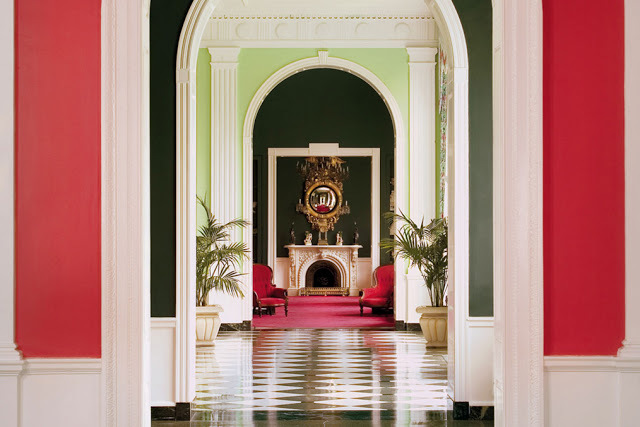 Beautiful enfilade at The Greenbrier. An expert’s eye at work. The Greenbrier. 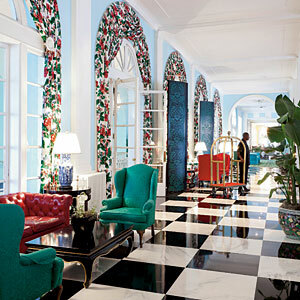 I love the turquoise walls and large-scale plant motif on the carpet. 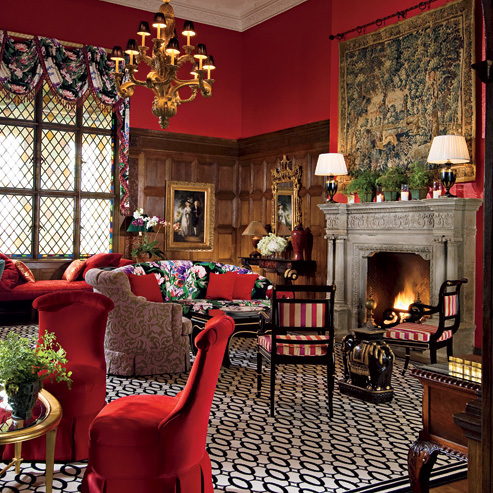 Photo: Courtesy Architectural Digest. David Hicks said Dorothy Draper was a great inspiration to him. The Metropolitan Museum of Art cafe. Photo: circa 1960s. 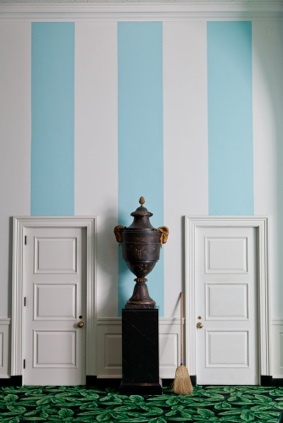 Fabulous wide stripes and oversized urn in the Greenbrier. Rhapsody in blue-green. A big room can take a big scale — the wallpaper and matching curtains really add life to this space. 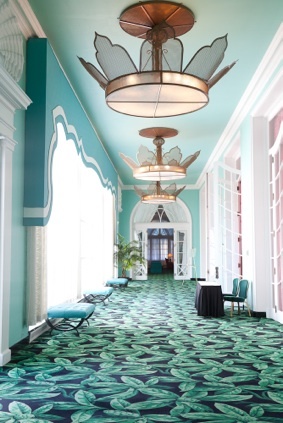 This entry was posted in American Baroque, Colours, Dorothy Draper, inspiration, Interior Design, Interiors and tagged chintz, colours, Dorothy Draper, Greenbrier, interior decoration, Interior design, patterns, Stripes, The Greenbrier Hotel. Bookmark the permalink.